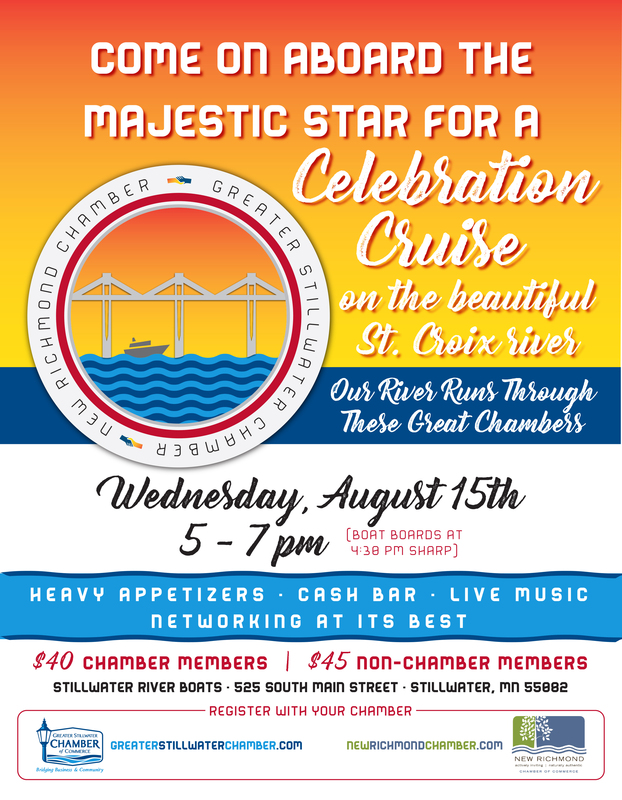 Come aboard the Majestic Star Riverboat for a Celebration on the St. Croix Cruise, hosted by the Stillwater and New Richmond Chambers! Now that the St. Croix River Crossing bridge is open, our towns are booming and we want to celebrate, together! Wednesday, August 15 from 5:00-7:00 p.m.
Open to Chamber members & Guests from the Greater Stillwater and New Richmond Chambers. Our River runs through these 2 great Chambers! Network & Mingle with Chamber members and guests while enjoying heavy appetizers and live music. Cash Bar. >>There will be Limited Seating, so please REGISTER EARLY! Click on Register Now button above! Thank You to Stillwater River Boats! We will boarding the Majestic Star at 4:30 p.m. SHARP! Fee includes heavy appetizers. Cash bar. >>There will be Limited Seating, please REGISTER EARLY!